Thermafleece UltraWool sheep’s wool insulation is a high density ultra-efficient insulation rich in British wool. The ideal choice if you are looking for maximum thermal performance when space is at a premium. 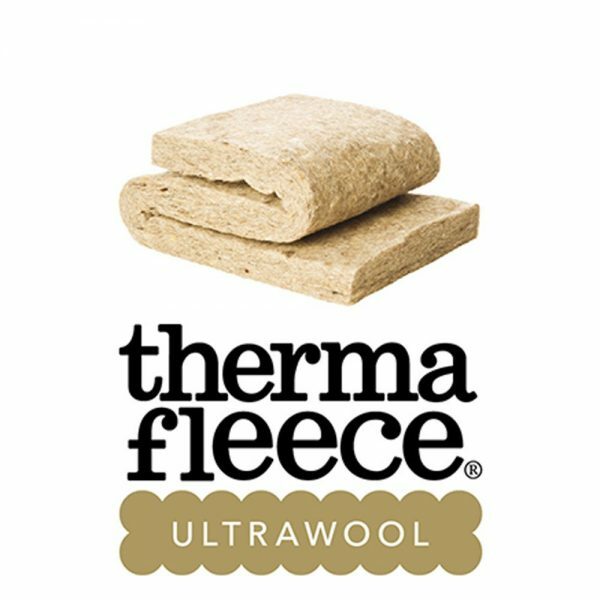 Thermafleece UltraWool sheep’s wool insulation is the best performing natural fibre-based insulation on the market (thermal conductivity = 0.035 W/mK). What’s more, with a density of 31 kg/m³, UltraWool helps provide exceptional acoustic insulation performance. Research shows that using 75% wool in combination with recycled fibres outperforms alternative products with a higher percentage of wool. The wool rich blend ensures you get the full benefit of sheep’s wool with enhanced performance, durability and sustainability. It is long-lasting, safe to handle and contributes to a healthier indoor environment by regulating moisture and absorbing harmful airborne substances. Thermafleece UltraWool is manufactured and supplied in accordance with ISO 9001 quality and ISO 14001 environmental management systems. Select this product when acoustic and/or thermal performance is most important. UltraWool is harmless so you can install it without protective clothing (we recommend you use a dust mask in enclosed spaces). It is therefore not irritating to the skin, eyes or respiratory tract. To retain the benefits of water vapour, absorption and release, UltraWool may be used in conjunction with a vapour permeable underlay. Protect the insulation from prolonged exposure to sunlight when unpacked and avoid wetting for extended periods. Store under cover and clear of the ground.